Constructed from a high impact polymer, the lightweight Model 865 Diamond Band Saw is designed for medium precision, with efficient cutting of hard and brittle materials. 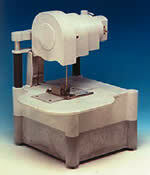 However, the saw is rugged enough to cut through materials such as soft metals and polymers as well. Samples can be safely hand fed into the blade with or without the standard specimen guide. The diamond plated steel core blades are designed to last long under normal conditions. Easy blade access and replacement make occasional saw maintenance extremely simple. Coolant is contained in a reservoir at the base of the saw. Quick adjustable blade guide keeps the blade tracking properly. Powerful motor cuts fast, won't bog down under load. Minimum coolant splash for clean cutting. Easy access coolant tray for fast and easy clean up. Large table for cutting bulk samples. Sample guide for straight, flat surfaces.